Messiah | Holy. Just. Love. The rest of Hezekiah’s story unfolds in today’s reading. As sad and foolish as this is, it providentially plays right into God’s sovereign plan for his erring nation. In chapter 40 we reach a set of words and phrases popularized in western culture through the masterful eighteenth century composer George Frideric Handel. Let these familiar “Christmas” verses of “The Messiah” find their original context in our minds today. And may the final chapter of Philippians be a great encouragement and motivation for our Christian lives today. and all its beauty  is like the flower of the field. 4:1 Therefore, my brothers,  whom I love and long for, my joy and crown, stand firm thus in the Lord, my beloved. 2 I entreat Euodia and I entreat Syntyche to agree in the Lord. 3 Yes, I ask you also, true companion,  help these women, who have labored side by side with me in the gospel together with Clement and the rest of my fellow workers, whose names are in the book of life. 14 Yet it was kind of you to share  my trouble. 15 And you Philippians yourselves know that in the beginning of the gospel, when I left Macedonia, no church entered into partnership with me in giving and receiving, except you only. 16 Even in Thessalonica you sent me help for my needs once and again. 17 Not that I seek the gift, but I seek the fruit that increases to your credit. 18 I have received full payment, and more. I am well supplied, having received from Epaphroditus the gifts you sent, a fragrant offering, a sacrifice acceptable and pleasing to God. 19 And my God will supply every need of yours according to his riches in glory in Christ Jesus. 20 To our God and Father be glory forever and ever. Amen. Messianic Prophecy: What Is It? Messianic prophecy is the collection of over 100 predictions (a conservative estimate) in the Old Testament about the future Messiah of the Jewish people. These predictions were written by multiple authors, in numerous books, over approximately 1,000 years. 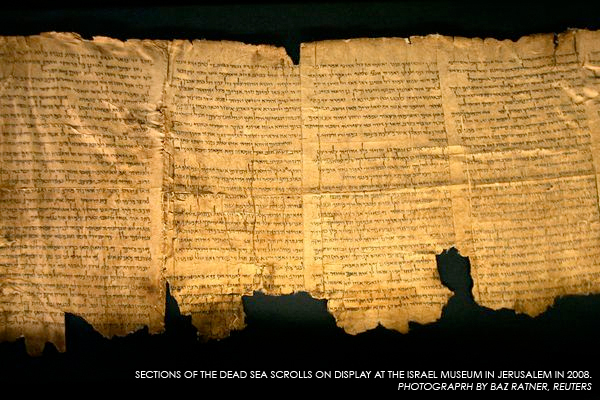 Messianic Prophecy is so dramatic today, because with the discovery of the Dead Sea Scrolls and the reliability of the Septuagint version of the Old Testament (both of which have been proven to exist prior to the time Jesus walked on the earth) you can be assured that these prophecies were not “conspired” after-the-fact. Messianic prophecy was fulfilled by the Messiah, Jesus Christ. Although many Jews did not accept Jesus as their Messiah, many did, and they became the Jewish sect later known as the Christians. Christianity, based in dramatic part on the fulfillment of historical prophecy, spread rapidly throughout the Roman Empire of the 1st Century. Examine the prophecies yourself, and calculate the probability of one man fulfilling just a handful of the most specific ones, and you’ll be amazed. The Old Testament verses are the prophecy; the New Testament verses proclaim the fulfillment. Check them all out for yourself! Messianic Prophecy – What Are The Odds of Fulfillment Without God? 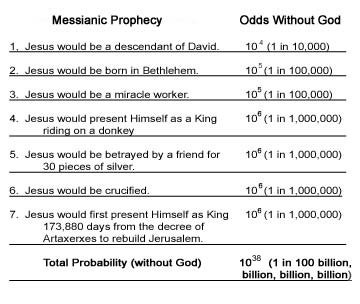 Messianic Prophecy is so powerful because of the statistical odds that one man would fulfill every single one of them. If we just analyze seven of the more specific prophecies in the Old Testament, that were later fulfilled in the Person of Jesus Christ, we are stunned by the statistical impossibility of such an historical reality. As an illustration, we have inserted some conservative “odds” alongside seven established prophecies. Please feel free to propose your own prophecies and your own odds – the dramatic point will still be made! Messianic prophecy is phenomenal evidence that sets the Bible apart from the other “holy books.” We strongly encourage you to read the Old Testament prophecies and the New Testament fulfillments on the previous page. Better yet, get a Jewish Tanakh (the Hebrew scripture read in the Jewish synagogues) and read the Messianic prophecies from there. It is dramatic, eye-opening and potentially life-changing! Copyright © AllAboutTruth.org, All Rights Reserved.